It’s been a while since I have written here. And from time to time I reflect a little on why. It’s because of Amy Poehler. More specifically it is because her quote-filled delightful book Yes Please. This is one of the quotes that really hit me. Amy was I believe referring to reviewers of her work. It kinda hit me in another way. For the vast majority of the life of FoG I have been talking about doing the thing. The thing being entrepreneurship, marketing, SaaS, sales, startups, angel investing, venture capital, and the like. A while back instead of talking and writing about the thing I started doing the thing. I like the doing. I like the doing more than writing about the doing. And the challenge of actually growing a business is a lot more interesting to me than telling other people how to go about it. Not sure if that is a fitting epitaph for FoG or even if it is dead. For now, I am doing the thing and having a lot of fun. Writing about the thing is just not something that I find that interesting right now. After two plus years at CallRail I am moving on. Team CallRail accomplished a great number of amazing milestones over the past two years and I am super proud of the role I played in making them happen. As a bonus, I had the opportunity to work with some fantastic folks and meet too many incredible marketers to count along the way. CallRail is doing really well right now highlighted by the fact that, according to the Inc. 500, it is the fastest growing company in the Southeast. On top of that, there is a solid foundation in place and strong pattern of growth for the future. CallRail is in a great spot. I remain an enthusiastic advocate and investor in the company. The search for my next venture is just beginning. While I do not know what that might be, I highly suspect that it will involve growing a technology company in one form or another. It is what I love to do and I seem to be pretty good at it. Toward that end, if I have been valuable to your career or entrepreneurial aspirations I would appreciate your assistance. I would welcome introductions to folks that are working on interesting things or make high-level hiring decisions for growing tech companies. I want to express my sincere gratitude to the CallRail management team for having the faith in me to help make things happen, the CallRail team for bringing it every day, and all the CallRail customers and business partners for putting your trust in us. Most of all I want to thank my family for the support not only during my time at CallRail but over the course of my career. Delivering fast growth is not easy and I could not do it without their love and encouragement. One year ago today I wrote about my first year at CallRail. So it seems only fitting that I provide an update on the progress we have made during the course of my second year. The best news of the bunch is that the story of business growth continues. Today CallRail is 100 employees strong with 25 or so on the sales and marketing team. Here’s a look back on what we have accomplished from a sales and marketing perspective over the past year, with a few things really being company wide successes. Number 107 on the Inc 500 fastest growing companies in America. Ranked the 34th fastest growing company in North America on Deloitte’s Technology Fast 500. The Atlanta Journal-Constitution top work place. Grew lead generation by over 70%. Brought our PPC and SEO efforts in house. The former enabled us to grow our paid spend into six figures while maintaining the same direct customer acquisition cost while the latter enabled us to grow our non-customer organic traffic by 60% while maintaining the high conversion rate of organic leads. Greatly increased our trade show presence through sponsorships at Digital Summit, Inbound, Marketing United, MozCon, SMX, and Unbounce CTA. Maintained our customer satisfaction leadership status on G2 Crowd while expanding our review efforts to Capterra, Google Analytics Partners, and TrustPilot. Created teams within the marketing organization to focus on branding and demand generation. Started a product marketing function. Continued to integrate with industry leaders such as Kenshoo and Marin. Increased the number of new customers closed per month by 47%. Closed enough deals to increase the size of the customer base by 75%. Expanded sales to Australia, Brazil, France, Germany, New Zealand, and the United Kingdom. Grew the sales team from nine to sixteen. Created a more formal sales management structure. Continued to refine our predictable revenue setup moving the sales development representatives into pure qualifier roles. Added quotas for all levels of the sales team. Continued to refine cadences and scripts for the inbound team as well as developing them for both the outbound and closing teams. Created and implemented an agency partner program. Entered into an agreement with WSI, the world’s largest network of digital marketing agencies. CallRail continues to see brisk demand and continues to do a good job of building it. Once again the base of this demand is due to an intense product focus by the founders and product development’s ability to improve an already superior product. In the past year we have launched new features such as CallScore, Keyword Spotting, a direct Google Adwords integration, mobile app outbound dialer, and improved form capabilities to keep us ahead of the competition. We spent the last year not only making the product better but organizing to scale. We have enough people now that the processes and systems that we have put in place around them has replaced individual effort that ruled the day at earlier stages of the company. The last year has been full of challenges, fun, and the CallRail team has accomplished a great deal. It will be interesting to see what happens over the coming year as the CallRail story continues to evolve. It seems like only yesterday I was joining team CallRail. Truth to be told it has been a bit over a year. I was reminded of this when that Atlanta Business Chronicle published an article on CallRail tripling in size adding 70 more employees to our swelling ranks. In true Atlanta style what the ABC published was a real estate article. Yes in the last year we moved from a live/work condo in Midtown to an entire floor of the Equitable Building. There is a lot more to it than a leasing story. It’s a story of business growth. If you look at the new and improved CallRail team page when I came onboard I was the 17th or so employee. About half the company had technical degrees and were building product. Four were in sales and marketing. The rest were helping customers. Today we are in the range of 55 people. Those people are much more evenly spread across development, customer service, marketing, and sales. Here’s a look back on what we have accomplished from a sales and marketing perspective. Grew from a team of two to eight data-driven marketers. Stood up a world-class marketing stack with Marketo, Salesforce, and our own app at the core. It was a finalist for a Marketo Revvie. We didn’t win but our video was shown to 6,000 marketers at the Marketo Marketing Summit. Moved from Niche player to customer satisfaction market Leader on G2 Crowd Review site. Doubled our PPC spend while lowering direct CAC. Grew our social reach by 190%. Experimented with new ways to fill the top of the funnel. Gave away a boatload of t-shirts. Too many to count, but it is two budget line items. Entered into some nice partnerships with companies like Acquisio, HubSpot, Marketo, Unbounce, and VWO. Grew lead generation by over 300%. Held CAC steady through all of this. Added seven new sales team members, bringing the team total to nine. Changed comp program to be more performance based. Implemented a predictable revenue sales organization with specialization of inbound SDRs, outbound SDRs, and account executive closers. Created cadences and scripts for the inbound team. Along with our marketing stack this resulted in a 20% increase in lead to close ratio. Created a dedicated outbound team. Defined monthly metrics for each sales role. Created leaderboards to drive sales team competition. Identified and promoted team leads to put us in a position to scale the sales organization. Closed enough deals to double the size of the customer base. As the ABC article stated CallRail is seeing brisk demand. However it’s not just latent demand. We made it, or at least built on demand that existed. The base of this demand generation is due to the founders focus on product and our engineering team’s ability to deliver a superior product. What I learned and had a hand in creating in the past year is a brand that is well-respected on the marketing technology space. CallRail is now used by nearly 40,000 companies and we are seeing larger and larger companies reach out to us on a daily basis. With all that said what got us here, which is perhaps the fastest growing profitable tech company in the South, is not going to get us there. The next year is going to be focused on organizing to scale. Scaling in a way that does not require heroic effort but does require skilled organization building. The last year has been full of challenges, tons of fun, and team CallRail has accomplished a lot. The coming year is going to be equally challenging and fun as we open a new chapter on the CallRail story. 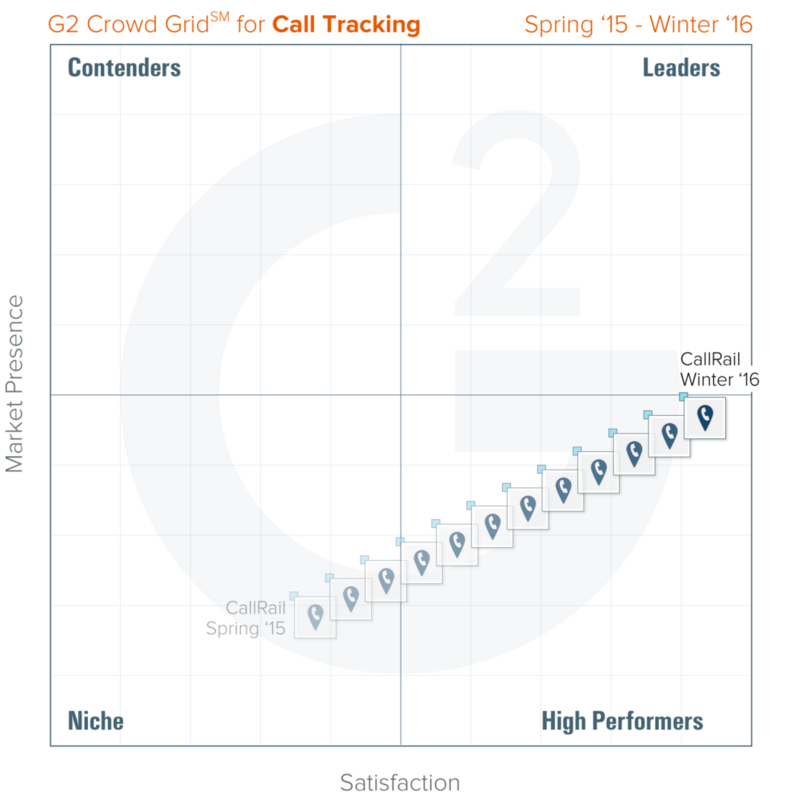 G2 Crowd, a Yelp for business to business software, released their evaluation of Call Tracking software yesterday. Based on reviews from more than a thousand product users, I am thrilled to say that CallRail was ranked #1 in user satisfaction. Our placement in G2 Crowd’s evaluation was based on more than 200 reviews from CallRail users, who praised our ease of use, robust analytics, wide range of integrations, great customer support staff, and being quite the bargain to boot. As you can see in the G2 Crowd call tracking grid, CallRail is literally off the chart. There can be no higher honor for us at CallRail than to be rated highest in customer satisfaction by our users. But there is one thing that I am equally pleased with about this ranking. 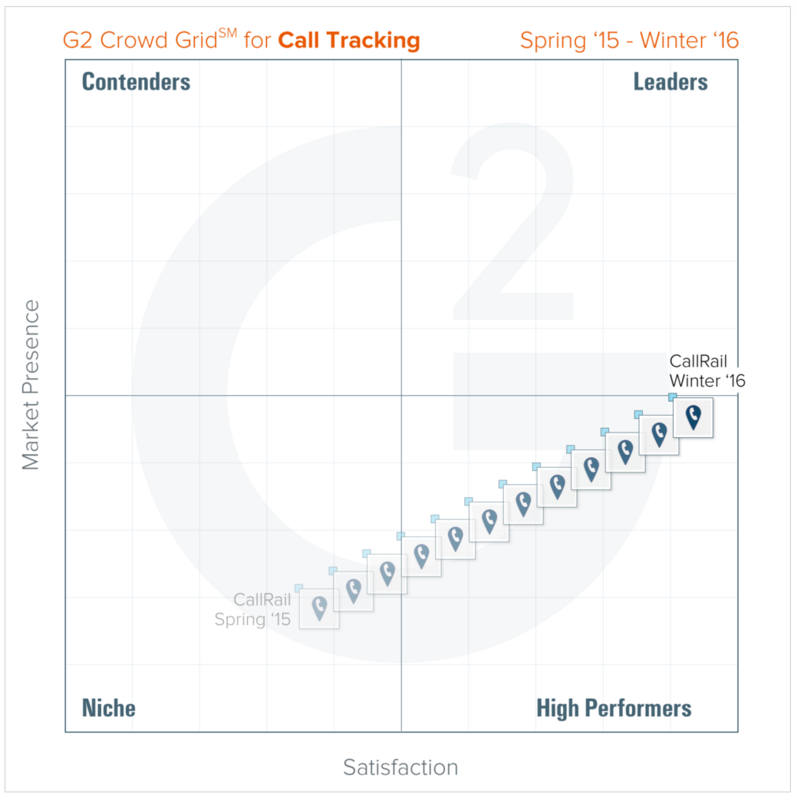 Back in April the CallRail marketing team saw an opportunity with the G2 Crowd call tracking grid and set out to become recognized as a leader in the call tracking market. In the report G2 Crowd did just that. Moreover CallRail was noted for its significant movement in position since the Spring ’15 report as you can see in CallRail’s grid velocity which is called out in the report. Going from a niche player to a leader with the highest customer satisfaction in eight months is quite the achievement. Good work by a good marketing team. This past weekend I got my trade show game on at the Digital Marketing Bootcamp put on by my friends over at the Local Search Association. LSA is in the business of local and the LSA Bootcamps are events that attract a broad range of SMBs that are looking to market online. A seemingly target rich environment for CallRail. LSA was looking for someone to give a talk on how to hire a digital marketing vendor and given all the work I have done around that topic it seemed a pretty natural for me. The presentation was pretty short and sweet. It is embedded below. The gist of the presentation is that hiring a marketing vendor is a lot like buying a car and when you compare cars it is good to do what Car & Driver calls a comparo. The meat of the comparo is the spec sheet and driver ratings (here is an example of one with the M3). Using the same methodology that Car & Driver uses to rank cars is a solid approach to select a marketing vender (we used it to select our marketing automation platform at CallRail, more on that at a later date). The framework really seemed to resonate with the participants. During the course of the presentation I provided the participants with three templates that they could use in their vendor selection process. The first was a marketing technology criteria evaluation template. The marketing technology criteria evaluation template is literally a spreadsheet that can be populated with selection criteria and then have the selection criteria ranked by the people involved in the selection process. In the template the ratings for two people are summarized on the first sheet. You can add or subtract sheets for people depending on the size of your team and roll it all up to the summary sheet. I have used this in the real world. It works very well. It forces you to think about what criteria are important and to rank how well each marketing technology delivers on that criteria. The second was a marketing technology price comparison template. When you are getting quotes from several different vendors at once it is often times hard to compare them apples to apples. Using this template will help solve that problem. It will also help you to get a better price. The third template that I provided was an agency brief. Where fairly simplistic the brief template is a good starting point to provide a little direction to marketing services companies when looking to bring one on board to help with a certain aspect of your marketing. I know this because I suggested we start using them at CallRail not too long ago to hire a marketing vendor. Since then the team has adopted it to provide first direction to the vendor when we are are starting a new project. So it is not only good for hiring an agency but can be used to get new projects started. Hiring a marketing vendor is not hard you just have to be methodical while trusting your instincts, make sure the firm or technology is going to work to grow your business, and hold the provider as accountable as you would an employee. 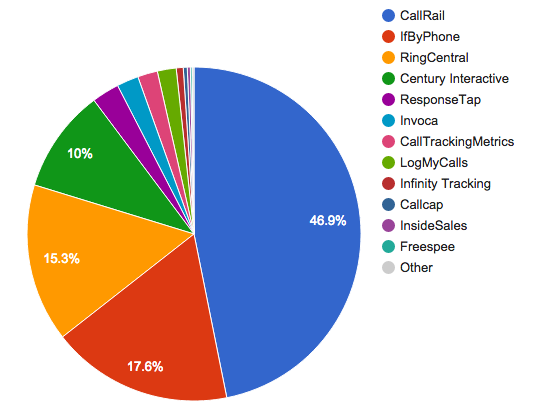 The other day, I got pointed to the Datanyze call tracking market share report. I did a little filtering to look at U.S. market share and it delivered the below chart. Turns out, according to Datanyze, CallRail is the market leader by a wide margin. Granted these market share figures are based on the number of web site installations and not on dollar volume. With CallRail’s focus on self service I expected us to have many more customers by count then our competitors that are more focused on the enterprise market and their needs. It’s good to see that assumption verified by a third party. I joined CallRail about 100 days ago. Pretty dead nuts on when you take into consideration vacation. When joining I set myself two big objectives. Double our revenue in 2015 and then again in 2016. I was given one other, figure out what is going on in the sales funnel. So I set my sites out to do those things. This is a little bit of that journey in my first 100 days. When I joined I was employee 17. I was the third person in marketing. Mark Sullivan who was doing a lot of byline articles and speaking events, and Erica Hawkins who did everything else. It was pretty obvious that if we were to scale this thing we were going to need more people. About two weeks in I also came to the conclusion that we were going to need to get a marketing automation program and enterprise level CRM in place to reach our goals. About two weeks after that SignUp4 was acquired by Cvent. It just so happens that I was going to dinner that night with my old friend Melanie Hall who ran marketing at SignUp4. She told me she has the perfect person for me, Ashley Coleman. She was and is. Ashley joined in early June as Demand Generation Manager. Early in Andy Powell asked her when she was going to select the marketing automation platform. Ashley had to remind Andy that it was only her second day on the job. She also committed to making that decision along with me by the end of the month. We ended up with Marketo and are in the process of deploying that and a Salesforce CRM instance by the end of this month. During this same time we had already put in motion some marketing programs to generate more leads. Leads grew 41% in the second quarter versus the first. Our two sales guys could not really get to them all. Leads were falling on the ground which was driving me nuts. That is when we decided to go down the road of sales specialization and bring on a sales development rep. We brought the first one on a couple of weeks ago, Mónica Mariño whom picked up out of HubLogix, and she is proving that the model will work for CallRail. So we have three people on the sales team and I expect we will be growing this in the future. So if you want to be an inbound SDR (we get about a thousand inbound leads a month right now), it’s not a bad place to be. Along the way Mark switched from a byline focus to a partnership focus. He is working with companies like Acquisio, HubSpot, Marketo, Optimizely, and TapClicks to build integrations into their products and get increased distribution for CallRail. Good move to focus there and it was his idea to do so. The last piece to come in place in my short time at CallRail is that we had a marketing coordinator come on board Monday. We have been looking for this person since before I joined CallRail. Essentially someone with three years of marketing experience that could write and knows social. It took two months to find one. Jessica Neal. At one point I was accused of being too picky. Maybe. But we need all A players on this boat. Maybe we need a bigger boat. I believe Jessica is employee 29 and we have two more starting after her that will bring the total to 31. To totally mix metaphors it seems we are bringing on the power we need to make the growth flywheel spin. With a solid foundational team now in place it is going to be quite interesting to see where we are after the next 100 days. A few days ago David C wrote a post about Quantifying Startup Quantity. I disagree a bit with the basic premise of the article. More companies is not necessarily better when it comes to growing a startup ecosystem or measuring its success. It might be more fun for lots of people that are playing house. Fun for what Keith McGreggor refers to non-trepreneurs. But its not success. A better measure of quantity of a startup ecosystem would be the number of people that are employed by technology companies created within the past five years. That’s an interesting number and one that can really nail down the health of a startup ecosystem. It’s a number that you can actually look at to watch an ecosystem grow and the employees in that ecosystem are the ones that might run off and create a company at some point in the future. Somewhere in our Twitter conversation Keith stated the following. For someone with ten years or so of listening to pitches from startup companies and being a very very early participant in the commercial internet industry some type of outlier 10,000 hour pattern recognition has developed for me creating a rapid cognition skill on selecting startups. I am sure I am not alone in possessing this skill set. It takes someone with it about 30 seconds to identify a startup that is not going to make it. I will stand corrected if someone wants to raise their hand and say “what about this one”, but of the thousands upon thousands of startups that I have seen in business development and startup advisory roles I don’t think I have ever been wrong in identifying a startup that would not make it. This all goes to say that a technology community should focus on startups that have an opportunity to become a business. When you get down to it the real measure of a startup ecosystem is the customer, revenue, and user growth that the companies within it obtain. Everything else is just a bunch of noise. It has been about six weeks or so since I joined the CallRail team. We have made a lot of progress in that short time. Getting our arms around some high level important metrics. Tweaking some of our current marketing efforts to make them a bit more productive. Hiring Ashley Coleman to implement some marketing technologies (we don’t have that many at the moment) and really drill down on what is driving customer growth so that we can make our marketing more effective and kick revenue into hyper growth. This week we made the biggest decision to date. We decided to organize the sales team using a sales development model. There were a lot of factors that lead to this decision. My experience watching Kyle Porter build the Sales Loft sales development organization, our investor Wain Kellum encouraging us to go down that road, and my general belief in the model. But the big driver of the decision was that our monthly inbound leads have increased 40% since the beginning of the year and our account executives are straining to pay attention to the big accounts that we want them to close and qualify new leads. We pay account executives to close deals. They need to be able to focus their time on doing just that. So CallRail is going down the road of sales specialization. Right now we are looking for an sales development rep to join the team to respond to the healthy flow of new leads every day, qualify them for our account executives, help us map out a winning SDR sales flow process, and potentially scale into a larger role as a leader of an SDR team. And while this great article “How I Ramped Sales Development in a Month” is focused on outbound one of the first things I am going to do is have the person we hire read it. Great roadmap for a lone SDR. Once we get inbound humming a suspect we will be ready to specialize a bit more by starting an outbound team. Just like in industrialization, specialization in the sales function is the winning road to be on.